You loved the shorts and gave us 5 stars, now, try the tights. These highly engineered cycling tights have great features and fit for All-Day rides in cold weather. As with any great cold weather product, we start with a highly technical, mid-weight stretch fleece fabric with all way stretch - POLAR FLEECE. The fabric is a knit with a hollow core polyester yarn that traps heat within the core of the fiber. The polyester yarns are knitted in a way that insulates and prevents cold air from entering, but allows breathability through wicking action. This means a warm and breathable tight that won't breakdown with long rides or harsh weather. The tights have an anatomical design and is padded for cycling. There is a deep side pocket for your phone or fuel. There are reflective elements on all of the important areas that create movement and visibility in the dark. There are six reflective locations that stand out when the lights hit the material. Next, we added useful features such as a reflective zipper at the ankle for easy on/off over shoes. Deep and easy to reach side pockets for your phone and small items. The key feature for safety is the high visibility option and reflective elements on the key moving parts like ankles, calves, and the side seams. 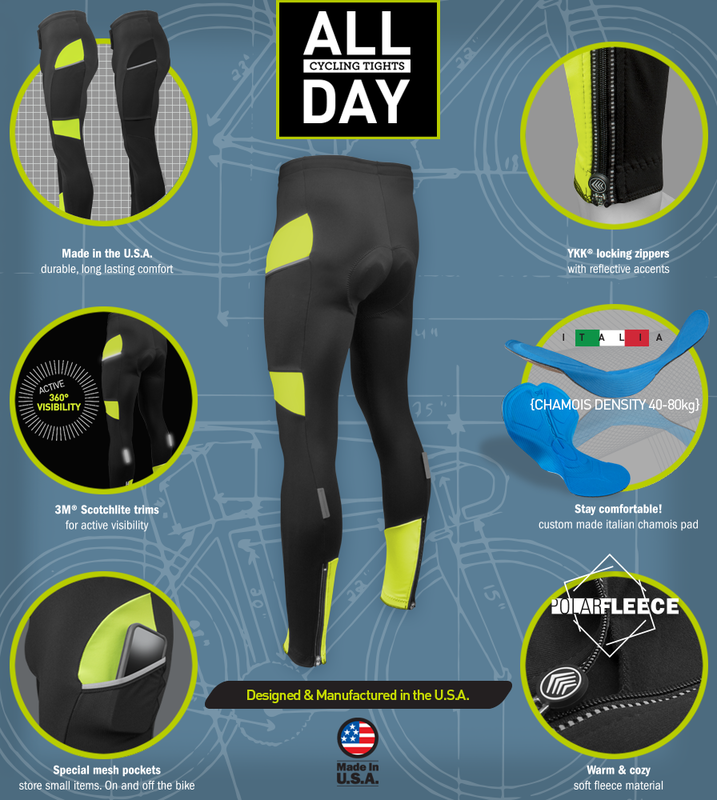 The All Day Padded Men's Cycling Tights are Made in our factory the USA then sold directly to you. This means no middleman or retailer mark-up and a better valued product for less! Push yourself to Ride ALL DAY and in ANY WEATHER with our All Day Cycling Tights! The All Day Cycling Tight comes with our All Day chamois pad which is a 6 hour pad for long distance. This Chamois is one of our newest and best valued pad. You can read the five star reviews from our All Day cycling shorts and see the high end value of this important aspect in design. The pad adds tremendous value to a long distance pad by cushioning the saddle area with a lightweight yet dense pad that feels wonderful. The pad is multiple layers with the top layer being a blue color, microfiber fleece with antibacterial finish, this is laminated to a lightweight foam. The pad is skythed cut with a lazer to a highly engineered shape for men's comfort on a bicycle saddle. Just the density needed is left behind on the foam once it is lazer cut to various thicknesses and cutouts. Foams are perforated for coolness and breathability. The All Day Chamois pad is 4 layer and three densities of foam. It is a top performance road pad designed to give cyclists all-round and long lasting comfort for rides up to 6 hours. The thickest areas have a dual density foam that puts two different densities of material in key areas. This guarantees top performance because of its foam combinations. Vibrations and shocks are absorbed by a high impact foam layer on the saddle side and comfort is optimized thanks to the medium impact foam which is the top layer in contact with the body. The elasticity of components enhances the pad's ergo fitting qualities while perforated foams improve breathability. In addition, the elastic carbon surface fabric enhances airflow thanks to it's funnel-like structure, leaving cyclists cool, fresh and friction-free. It's carbon yarns are bacterio-static, in other words, they dissipate static electricity and have a permanent antibacterial effect that eliminates the risks of infection. Elastic backing provides support without restricting the pad's all way stretch and breathability. This is a long distance cycling pad, with a 10 mm thickness at the ischial bone area with a density of 40 to 80 kg depending on the area of the saddle. The fabric on the face of this chamois is a highly technical blend of microfibers that prevent the growth of bacteria through a fine antibacterial stripe. This pad is designed for long distance - six hour rides, and century events. The pad's key component is the highly engineered Italian foam that cushions with a dual density, with high impact support in key areas. I've been wearing AT cycling shorts for some years now, and they are so durable I decided to give their tights a shot. They are my first padded tights and the first with zippers at the ankles which are taking some time to getting use to. I've worn the tights on 5 rides of 15 to 20+ miles and with temps in the 30's with the wind chill. My legs have never been cold. On the first 2 rides the padding was uncomfortable, but it has since gotten broken in and feels comfortable and doing the job it's supposed to do. The tights are very rugged, very well made, and I expect them to last a very long time as do the AT shorts. My money has been well spent on AT products. These tights are a nice addition to a collection of cycle gear. They are good for this Houston weather not too thin not too heavy. I like the added reflective tabs and the ankle zippers, almost forgot and the side mesh pockets. Keeps the knees and calfs warm. These tights are a nice addition to a collection of cycle gear. They are good for this Houston weather not too thin not too heavy. I like the added reflective tabs and the ankle zippers, almost forgot and the side mesh pockets. Keeps the knees and calfs warm. And yes there is quite a substantial amount of chamois pad, but I will make it work. Better to have more than less. These tights are very comfortable and warm. The pad is placed perfectly. Sizing is true to size.